Optimus Prime! He's the last knight! Maybe. He did acquire some period armor and a sword in the last film, Age of Extinction, before jetting off to space. Everyone knows that you can tell a knight by their armor, so, perhaps those new medieval duds inspired the name. Alas, the teaser itself doesn't drop any other tidbits. 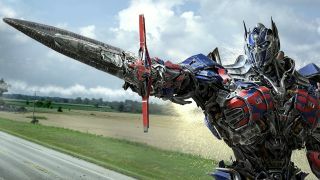 There's no footage from the fifth installment in the Transformers movie-verse as the movie doesn't start shooting until next month. The only thing we know so far - apart from its title - is that Bay will direct the sequel as his last ever Transformers film. After that, the franchise will continue forward with more follow-ups and spin-offs as part of a newly-spawned expanded universe that includes a dedicated Bumblebee film. Directed by Michael Bay and starring Mark Wahlberg and Jerrod Carmichael, Transformers: The Last Knight is scheduled to open in the US and UK on June 23, 2017.